Monitoring turbines with oil analysis is well known and well established. All turbines, both steam and gas, have a large oil reservoir to lubricate the turbine bearings. Older designs had separate sumps for the hydraulic control of valves, whereas newer designs may have the lube oil and hydraulic sump linked together. 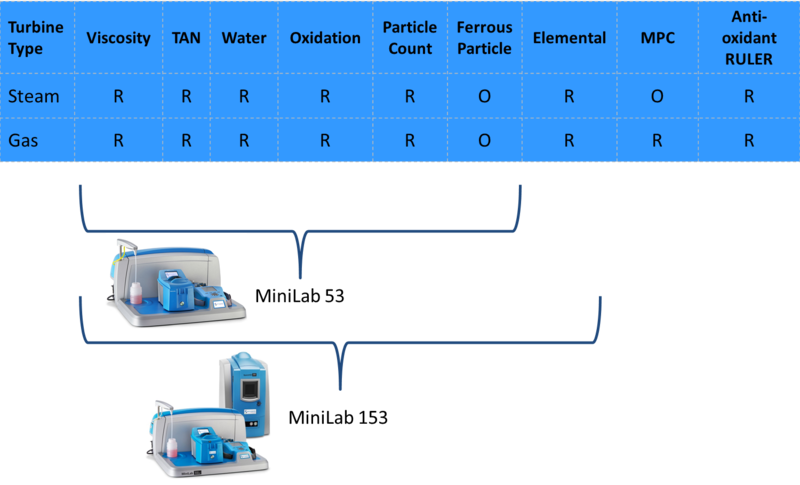 Power plant operators new to oil analysis can be easily confused about what all the tests are. Fortunately, the industry has developed umbrella specifications for power plant lubrication monitoring, such as ASTM D4378 and ASTM D6224, and these define almost every test used to qualify lubricants for new and in-service monitoring for power plants. ASTM D4378, "Standard Practice for In-Service Monitoring of Mineral Turbine Oils for Steam, Gas, and Combined Cycle Turbines", focuses on recommended tests for steam and gas turbines. According to ASTM, the purpose of this practice is "to maintain effective lubrication of all parts of the turbine and guard against the onset of problems associated with oil degradation and contamination." ASTM D6224, "Standard Practice for In-Service Monitoring of Lubricating Oil for Auxiliary Power Plant Equipment", focuses on auxiliary equipment that supports power generating turbines. Auxiliary equipment includes things like gears, hydraulic systems, diesel engines, pumps, compressors, and electrohydraulic control (EHC) systems. In Ask the Expert we try to distill all this information down to its basics, such as which specific tests you should focus on and what equipment suites allow you to perform these tests on turbines and supporting equipment. The resistance of a fluid to flow under gravity. Viscosity is the most important lubricant physical property. Lubricants must have suitable flow characteristics to insure that an adequate supply reaches lubricated parts at different operating temperatures. The viscosity of lubricants varies depending on their classification or grade, as well as the degree of oxidation and contamination in service. Oil viscosity is expected to rise over time and use, and loss of viscosity is considered to be more serious than an increase. In power plants, viscosity is routinely measured right after an oil change to confirm the right oil was added, as well as on a periodic basis. New technologies make it easy to measure kinematic viscosity- solvent free, low volume systems are available that combine ease of use with data logging ability. Refers to a titration method designed to indicate the relative acidity in a lubricant. The acid number is used as a guide to follow the oxidative degeneration of an oil in service and is frequently referred to on OEM equipment or lubricant supplier guides that power plants follow. Oil changes are often indicated when the TAN value reaches a predetermined level for a given lubricant and application. An abrupt rise in TAN would be indicative of abnormal operating conditions (e.g. overheating) that require investigation. Water is the most common liquid contaminant in power plants worldwide, and always needs to be monitored. Excessive water in a system destroys a lubricant's ability to separate opposing moving parts, allowing severe wear to occur with resulting high frictional heat. Water contamination should not exceed 0.25 % for most equipment, and not more than 100 ppm for turbine lube and control systems. A number of new technologies are out there to detect water contamination in lube oils, and on site results correlate extremely well with laboratory techniques. Refers to the level of antioxidant additive present. As Oxidation products accumulate, causing the oil to become degraded, and in most instances, slightly acidic. If oxidation becomes severe, the lubricant will corrode the equipment critical surfaces. Long life turbine oils contain additives designed to suppress the effects of oxidation such as sludge and varnish. Varnish deposits still concern turbine maintainers working with API Group 2 oils. Simple filter and color spectrophotometers used on site help to determine if a varnishing situation is taking place. The measure of cleanliness of oil, it is a critical test for hydraulics, turbines and filtered gearboxes. This test has evolved to be so much more than just a measure of effective filtration. Newer technologies such as LaserNet Fines not only count particles and report to ISO 4406 or SAE AS 4059 , they also provide more detail to understand why and where the particles are coming from. Particle imaging enables the power plant maintenance team to immediately see sand/dirt particles and also the level of ferrous debris that is contributing to the count. This level of detail enables smarter work orders to be developed, focusing on eliminating the root cause of the high counts. Technique for detecting and quantifying metallic elements in a used oil resulting from wear, contamination and additives. The oil sample is energized to make each element emit or absorb a quantifiable amount of energy, which indicates each element's concentration in the oil. The results reflect the concentration of all dissolved metals (from additive packages) and particulates. 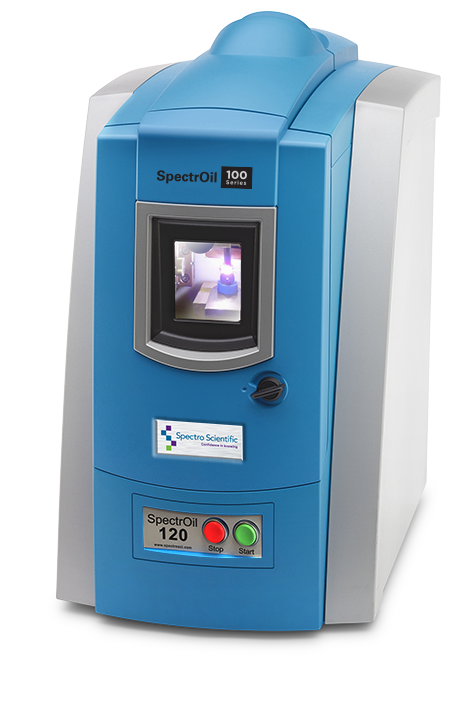 This test is the backbone for all on-site and off-site oil analysis tools , as it provides information on machine, contamination and wear condition quickly and accurately. Its major limitation is that its particle detection efficiency is poor for particles 5 microns (µm) in size or greater. Many OEMs report out elemental wear for alarms, so make sure you review the OEM guides for starting points. WDA describes either a patch or an analytical technique which separates magnetic wear particles from the oil and deposits them on a glass slide known as a ferrogram. Microscopic examination or the slide or patch permits characterization of the wear mode and probable sources of wear in the machine. This technique is known as analytical ferrography. It is an excellent indicator of abnormal ferrous and non ferrous wear, however it is usually only carried out by a trained analyst.